What immediately made me want to read Bright Before Sunrise is the fact that the entire novel happens in 24 hours. Instead of an extensive look into the lives of our two main characters, Jonah and Brighton, readers get a brief glimpse into a mere day. In fact, I will warn you now: if that’s not your sort of thing, you’re probably not going to enjoy this book. But if you like getting to see just a small part of a character’s story and don’t mind imagining the future that lies ahead of them (hello there, romance) it’ll definitely work for you. My favorite thing about this story is that it shows us how perceptions can shift in such a short amount of time. Everyone has thoughts on just about everything and everyone they encounter. But I’ve always firmly believed that, unless you’ve experienced something firsthand, your opinion will just be based on hearsay and ideas put in your head. Jonah and Brighton have ideas about things (each other, certain places, themselves), but find them challenged during this one night they spend together. Of the two, Brighton is my favorite narrator. She’s smart, sensible and just plain nice, the kind of girl who everyone wants to be friends with. She might seem a bit bland and lacking in personal conviction initially, but she actually has strong opinions and feelings. What I particularly admired most about her was her willingness to sacrifice herself to help others (even though I also thought it was a bit extreme), and her positive attitude towards the world in spite of her emotional baggage. Jonah, on the other hand, was a little hard for me to like. He’s surly, pessimistic and angry at his current circumstances. Even though there was a rational explanation for his acting out, it still felt a little bit too much. Plus, what he happens to do to Brighton? Not cool at all. But by the end of the novel, I could see glimpses of the real Jonah – athletic, friendly, kind, understanding – which improved my opinion of him. Between these two, there are a lot of shenanigans that go on in 24 hours. It seems likely that they would have a romantic encounter, but it really only existed insofar as they had a mutual understanding by the end of the night. I was sadly unaffected by the “romance”, though I realize 24 hours is not enough time to develop true feelings about their relationship. 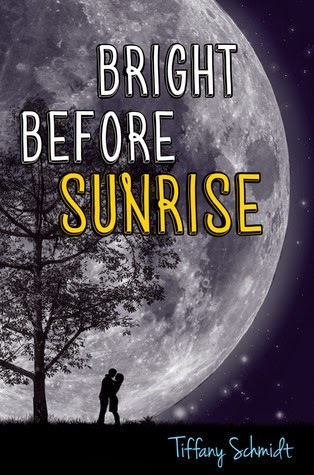 Bright Before Sunrise was a fast-paced contemporary read, filled with dramatic encounters, emotional sidebars and just a touch of romance. While I didn’t fall in love with it (not the way I loved The Best Night of Your (Pathetic) Life or Graffiti Moon), it was a pretty good story. Oh I'm glad you liked this one! I think the few reviews I read for it weren't very positive so I was nervous about it. I'll have to give it a try; I haven't read anything that takes place in 24 hours (or other short period of time) but am curious at how they would play out! I really enjoy books that just cover 24 hours! They might seem pretty short, but really, I love that we get to experience ONE DAY in the lives of these characters. Graffiti Moon is probably my favorite, but Bright Before Sunrise was good too. This book is on the very top of my TBR list. I'm finally getting it really soon! Thanks for the review, I'm glad you liked it! I really liked this book, maybe partially because 24-hour stories aren't normally my thing so I had fairly low expectations going in. I respected that Tiffany Schmidt realized that a night wasn't enough time to fall in love and let Jonah and Brighton's relationship play out the way it did. For me, 24-hour stories are fun to read. I just try to keep in mind that it's such a brief amount of time, so the way characters will be by the end of the book might be different than if it had happened over a few months. I'm glad you liked this! I'm not sure how I feel about 24-hour stories, but you do have me curious! I'll probably try to get this from the library since you didn't love it. I hope that you wind up enjoying it if you do get it from the library. I do think you should read Graffiti Moon first if you haven't read it yet though!